This season sure has me sneezing a whole lot more, but also thinking about and noticing all the beautiful flowers coming into bloom. Hardy ice plant with its wispy, purple-petalled flowers. A crowd of ultraviolet Echium candicans that line the steps down to the beach where I live. 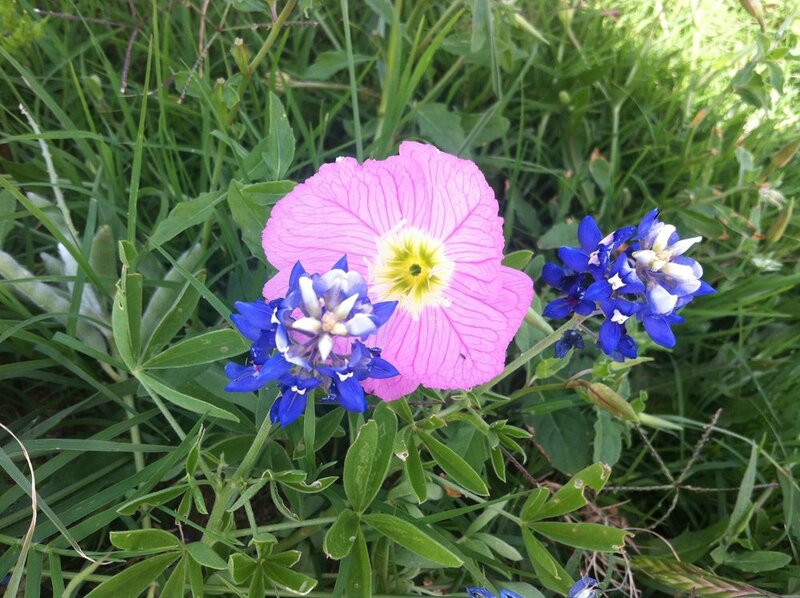 And I’m reminiscing about the Texas bluebonnets and pale pink, nameless-to-me wildflowers that are surely proliferating in the field right now beside where I used to live in Austin. I was reminded, too, of a wonderful On Being interview with Dr. Robin Wall Kimmerer, author of Gathering Moss: A Natural and Cultural History of Mosses and Braiding Sweetgrass, that offers many insights into both the artistic and scientific mysteries of flowers and plants. “I very proudly entered the forestry school as an 18-year-old and telling them that the reason that I wanted to study botany was because I wanted to know why asters and goldenrod looked so beautiful together. These are these amazing displays of this bright, chrome yellow and deep purple of New England aster, and they look stunning together. And the two plants so often intermingle rather than living apart from one another, and I wanted to know why that was. I thought that surely in the order and the harmony of the universe, there would be an explanation for why they looked so beautiful together. And I was told that that was not science, that if I was interested in beauty, I should go to art school. Which was really demoralizing as a freshman, but I came to understand that question wasn’t going to be answered by science, that science, as a way of knowing, explicitly sets aside our emotions, our aesthetic reactions to things. We have to analyze them as if they were just pure material, and not matter and spirit together. And, yes, as it turns out, there’s a very good biophysical explanation for why those plants grow together, so it’s a matter of aesthetics and it’s a matter of ecology. Those complimentary colors of purple and gold together, being opposites on the color wheel, they’re so vivid, they actually attract far more pollinators than if those two grew apart from one another.